It’s Halloween and in New York it is taken very seriously. I have just walked home from E’s swimming lesson and the streets are full of adults and children dressed in all manner of crazy costumes. I had to shield J from the man who was wrapped in bandages, holding a severed head with a meat hook and sporting a large grey rat gnawing into the bloody gauze on his head…Yuck. J and I are hiding indoors, providing sweets to trick or treaters, as he has taken completely against Halloween and will not wear a costume and freaks out when he gets anywhere near anyone in fancy dress. R has taken E out trick or treating resplendent in her huntress outfit inspired by The Hunger Games. 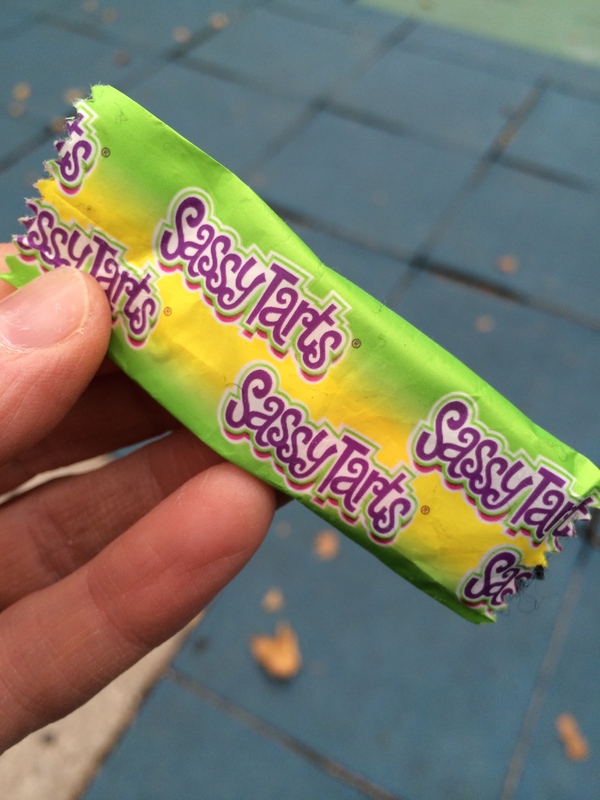 The best named sweets for this year are Sassy Tarts. In the interests of my readers, I ate the one pictured below and it turns out to be a rather disappointing tablet sweet. A bit like a refresher, if you remember those (still around?) but more like some kind of chalky heart burn tablet! I’ll stick with chocolate, even if it is American. Categories: Halloween | Tags: fancy dress, Sassy Tarts, sweets, trick or treat | Permalink.